You can get everything from your initial 120-hour TESOL Certification to a Masters degree through one of the hundreds of accredited TESL Canada course providers. TESL Canada is the only accrediting body in the world that has set standards for advanced courses, such as the ones offered by Coventry House International-OnTESOL, and Masters degree programs in Education, TESOL, and Linguistics. TESL Canada is not only for Canadian teachers who want to teach English in Canada. Native-speakers from Canada, the US, the UK, Australia, New Zealand, and South Africa and non-native speakers who have a valid proficiency score can use their TESL Canada accreditation to teach English anywhere in the world. 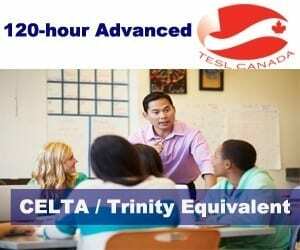 TESL Canada exceeds the international standard of 120 hours of instruction with a 12-hour teaching practice module offered by CELTA and Trinity CertTESOL. The minimum TESL Canada accreditation level (Standard 1) requires at least 120 hours of instruction and the Practicum module has to be at least 20 hours. You can also start with a 250-hour TESOL Diploma program to get the best training from the beginning and qualify for TESL Canada Standard 2 accreditation. When people take an introductory course with an institute such as Oxford Seminars, I-to-I, TEFL Online by the University of Toronto, or Global TESOL, they need to take an accredited course from the very beginning and spend hundreds of dollars again to continue their career in Canada or another native-speaking country. TESL Canada is perfect for teachers who want to go abroad with an internationally recognized course and upgrade their credentials in stages. There isn’t a deadline to complete the Practicum module, so you can start with the online course and complete the Practicum anywhere in the world when you want to get your TESL Canada accreditation. Qualify for The Best Jobs in The World with TESL Canada Accreditation!